Six venues at the university hosted competitions in which teams from universities from all four states participated. 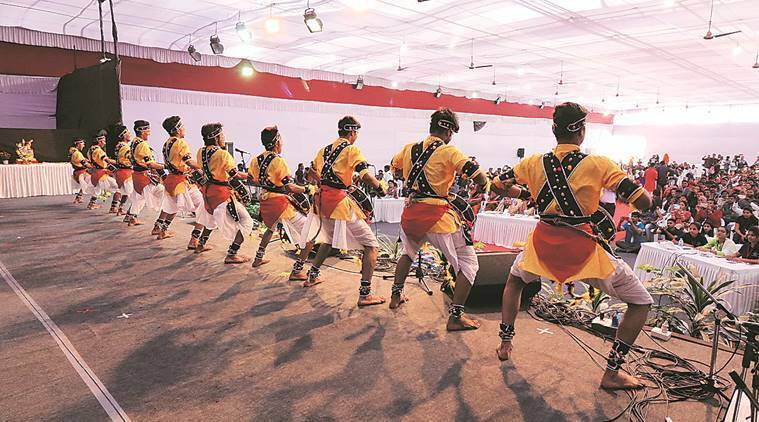 The second day of Yuva Spandan, an inter-university fest, was marked by the sound of drums, traditional attire with bright colours and tunes of folklore from Maharashtra, Goa, Gujarat and Rajasthan on Thursday. Savitribai Phule Pune University (SPPU) is hosting the youth festival, in which universities from the four western states participate, for the first time. On Thursday, various competitions like rangoli, one-act plays, mimicry, classical and western music performances, folk dances, quiz and photography were conducted. The one-act plays mostly focused on entertainment with a social message, raising issues like urbanisation and family values. Mimicry artistes preferred cartoon characters, politicians and artists for their performances. Some of them also mimicked sounds of vehicles, musical instruments and electrical devices. Folk dances showcased the vast diversity of Maharashtra, Goa, Gujarat and Rajasthan not only in their costumes and ornaments, but also in the accompanying instruments and vocalists. All the groups had live music accompaniments, making their performances more lively, energetic and vibrant. The day was concluded with ‘Kalavant Katta’, where students interacted with photographer Satish Paknikar and graphic designer Sandesh Bhandare.